As one of my closest supporters — I wanted to send a note to say thank you and invite you to be part of a special opportunity. Not to get technical about it, but what that says is Ted Cruz is one of his closest supporters. Which, not to get technical about it, is actually true. Let me explain: as I write this to you today, our campaign is working overtime to secure enough delegates to ensure we win the nomination. While the exact delegate count between the candidates is in constant flux, our wins in Wisconsin and Colorado last week have put us on a path to victory before the convention. And while not everyone can be an official convention delegate, I’m asking you to join my online team by becoming a Deputy Delegate today. 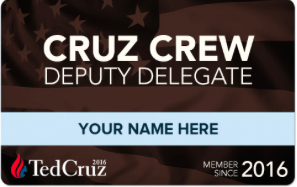 Click here to confirm your Deputy Delegate status, and we’ll mail your official DEPUTY DELEGATE CARD to you. But you have to act in the next 48 hours — we are working to secure a team of Deputy Delegates all across the country committed to support my candidacy and our drive to secure the 1,237 official delegates needed to win. Just ask Donald Trump and John Kasich. But . . . seriously? Deputy Delegates? Does a decoder ring come with it? This entry was posted in Uncategorized and tagged Cruz Crew, Deputy Delegate Card, Donald Trump, John Kasich, R-Come to Jesus, Ted Cruz. Bookmark the permalink. That’s what you get for your charter subscription to The Weekly Standard, John. Only yourself to blame. And, what’s this? Not a peep about The Globe’s “satirical” front-page mock in their Sunday brick?